Manchester/Salford Anarchist Bookfair 2nd Dec 2017. 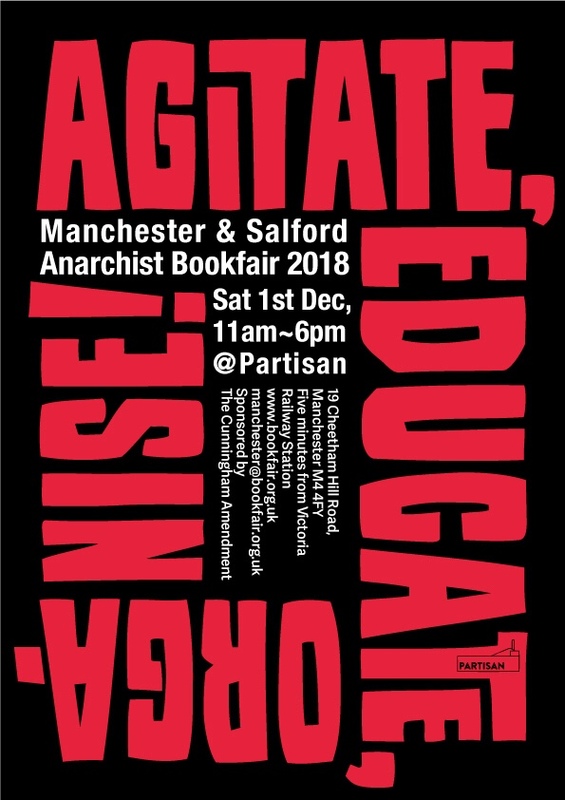 The Manchester and Salford Anarchist book Fair is from 11am to 6pm on Saturday the 2nd of December 2017 at the 'PARTISAN' new alternative Social Centre, a short walk from Manchester Victoria Railway Station. It's mostly a line-up so far of radical campaigning and community stalls but with the SolFed and AF present and the PM Press bookstall worth a look. No meetings listed at present but that will presumably change nearer the date. So only a couple of weeks now to this. Unfortunately still no meetings list up on their website as yet although I understand the SolFed does have a meeting planned. Maybe this is worth a read in advance (or afterwards if you miss it) see: https://libcom.org/library/fighting-ourselves-anarcho-syndicalism-class-struggle-solidarity-federation. It got a lot of both positive and critical reviews and discussion on this site. And better late than never a provisional list of short meetings are now available on the website including those from the AF, SolFed,the IWW and Plan C, plus some others which have potential to be interesting, some starting as early as 11.30am. Bump - this Saturday 2nd December. A well attended event with lots of younger (than me) people. The meeting space had it's limitations and unfortunately Plan C didn't turn up for their planned meeting but otherwise it seemed well organised and a useful day for many. I personally would still appreciate a bit more representation from the fringe Marxist groups that get a hearing on libcom alongside the usual campaign and 'community' groups but the organisers appear set against that. Yes, a really good Book Fair. Maybe its size, location and content heralds the way for the future. Small regional fairs of around two dozen stalls. Well organised and publicised. stall holders were quick to spot it and deal with it accordingly. Size matters. A great day. Thanks to the organisers. I personally would still appreciate a bit more representation from the fringe Marxist groups that get a hearing on libcom alongside the usual campaign and 'community' groups but the organisers appear set against that. Why are the organisers against involving Marxist groups? Can't speak for this particular bookfair, but from my experience with bookfairs in Canada, it's basically only about the branding. This leads to big-tent anarchism and allowing groups that are far more troublesome politically than most groups that are excluded for having "Marxist" in their name. One clue why Marxists don't get invited is to be found in the title of the Book fair. From a "punter's perspective" it can be confusing to find Marxist groups at an Anarchist book fair. Gives the impression they must be friends of ours. Anarchism has always attracted (big-tent) environmental activists, vegans and fringe religions. But the first steps into a revolutionary outfit is not always through tightly-argued dogma. PTCA seems to consider that anarchists are somehow immune from dogma but I'm not so sure and certainly environmental activists, vegans and supporters of fringe religions are not on any automatic transition to becoming anarchists let alone anarchist communists. The label 'anarchist' and the label 'Marxist' each cover an awful lot of divergent and often antagonistic currents of thought and practice which sometimes means there are overlaps. Both the London and Sheffield Anarchist bookfairs have accepted carefully considered minority tendency 'Marxists' to attend with stalls and meetings without the 'punters' getting too confused! Personally I appreciate the potential for dialogue that such an approach has generally encouraged. Of course the absence of self identifying Marxist groups doesn't in practice stop the same ideas appearing at anarchist bookfairs, including Manchester's, via invited booksellers and other groups that title themselves differently but are still influenced by some Marxist currents of thought. would expect to find stalls promoting what it says on the tin. Happenings of interactive dialogue are perhaps better placed in meeting rooms. I once attended the Sheffield Anarchist Book Fair (the one with the huge FREE COMMUNISM banner outside). Under the Trades Description Act is should have been more properly renamed "The Left Wing Book Fair" or "A Working Class Book Fair". It was hardly Anarchist. Er... free or libertarian communism is anarchism. Rag, tag and bobtail, beatniks, bohemians, Crusty the Clown, the International Brigades Memorial Trust and Cupcakes R Us are not. Colin Ward also despaired of Anarchists who spent their time decrying fellow comrades. many manifestos, analyses, and sets of principles, that there was just a hint of Crusty the Clown. Sometimes there is need to take the foot of accelerator. What's the point in a political ideology that contains no fun, no mischief, no joy? Who knows? One day these deep theoretical bunkers might let in some of the sunshine. So this well attended anarchist bookfair was the last one after the now sadly ill-fated, and it seems not to be repeated, London one that I attended. It looks like some of the other regional ones that have previously been regular events may not re-appear this year. On the three listed in Freedom there is also a massive absence of any advance info with often no relevant website and little to show on linked Facebook sites - is this significant? No not really, info usually comes through in dribs and drabs, and there's often ones which drop off for a couple of years then come back. The 2018 list (of 11 bookfairs, not three) is actually longer than for 2017, which had nine. Manchester & Salford Anarchist Bookfair.